The first color wheel invented by Sir Isaac Newton in 1666, was used to illustrate a rule for the color of mixtures of lights. 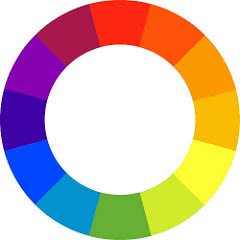 You can identify primary, secondary and tertiary colors on such a wheel and it help you in choosing colors that match. Primary colors are red, blue an yellow. Secondary colors are green, purple and orange, while tertiary colors are red-purple, blue-purple, red-orange, yellow-orange, yellow-green and blue-green. Warm colors would be yellow, red and orange and green, purple and blue are cold colors. You can try to match all three primary colors, but it would be a very colorful look. For a more classy and elegant look choose only two of the primary colors. Complementary colors can be identified by looking at the color wheel and choosing one color and its exact opposite. This would be they way to construct a color blocking outfit. You will definitely stand out in a color blocking outfit, but it has been very in in the last years. Analogue colors are the ones that stand next to each other on the color wheel. This is the "safe" way to go if you do not know how to match colors or if you like a more toned down outfit. Neutral colors like beige, brown, grey,black, kaki and white go with every color. You can mix them with primary, secondary or tertiary colors, but also among each other. You can try to stick to this rules, but remember to always have fun when mixing your colors.